Hodie 2a vice lecta est Billa, intituled, "An Act for enclosing and dividing the Common Mead, or Moor, called Speen Mead, or Speen Moor, in the County of Berks." Vis. Lonsdale. L. Bp. Hereford. L. Bp. Bristol. L. Delawarr. Hodie 1a vice lecta est Billa, intituled, "An Act to enable Dorothea Clerk to sell Lands in the County of Dumfries, for Payment of Debts charged thereupon; and to purchase other Lands, to be settled to the same Uses as the Estate to be sold is settled." The Earl of Warwick reported from the Lords Committees to whom the Bill, intituled, "An Act for enclosing and dividing the Common Fields and Common Grounds, in the Manor and Parish of Binbrooke, in the County of Lincolne," was committed, "That they had considered the said Bill, and examined the Allegations thereof, which were found to be true; that the Parties concerned had given their Consents; and that the Committee had gone through the Bill, and made several Amendments thereunto." Hodie 3a vice lecta est Billa, intituled, "An Act for the effectual Draining and Preservation of certain Fens called Cawdle Fenn, Waterden, and Redmoor, and One Piece of Fen Ground called The Holts, in the Isle of Ely, in the County of Cambridge." Hodie 3a vice lecta est Billa, intituled, "An Act for enlarging the Time granted by an Act passed in the Third Year of the Reign of His late Majesty King George, intituled, An Act for enlarging the Time granted by an Act passed in the Eighth Year of the Reign of Her late Majesty Queen Anne, intituled, An Act for making a convenient Dock, or Bason, at Liverpool, for the Security of all Ships trading to and from the said Port of Liverpool; and for enlarging the same, by making an additional Dock, and building a Pier in the open Harbour there; and for enlightening the said Dock." Hodie 3a vice lecta est Billa, intituled, "An Act for the better regulating the Manufacture of Narrow Woollen Cloths, in the West Riding of the County of York." The House (according to Order) was adjourned during Pleasure, and put into a Committee upon the Bill, intituled, "An Act for granting an Aid to His Majesty, by a Land Tax, to be raised in Great Britain, for the Service of the Year One Thousand Seven Hundred and Thirty-eight." Barnwall to enter into Recognizance for Edgworth. The House being moved, "That Patrick Barnwall Esquire may be permitted to enter into a Recognizance for Robert Edgworth Gentleman, on account of his Appeal depending in this House; he being under Age:"
It is Ordered, That the said Patrick Barnwall may enter into a Recognizance for the Appellant, as desired. 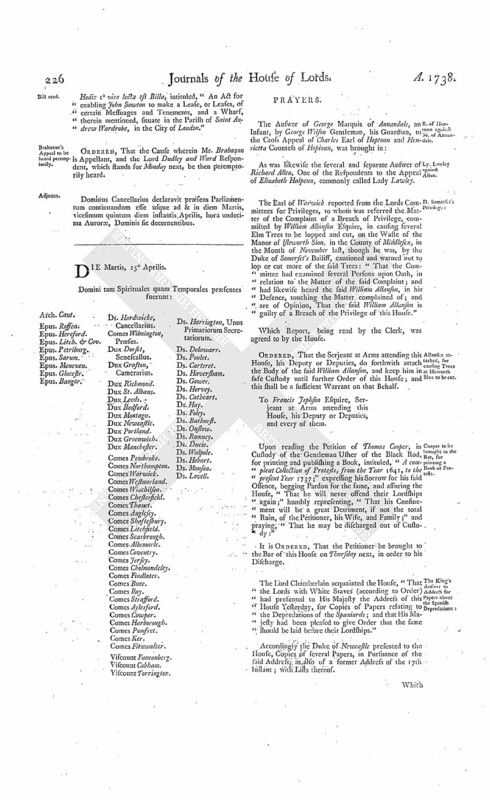 It is Ordered and Adjudged, by the Lords Spiritual and Temporal in Parliament assembled, That the said Orders, or Decrees, complained of in the said Original Appeal by the said Walter Bagenall, be, and the same are hereby, affirmed, with these Additions to the Decree of the 21st of February 1736; videlicet, "After the Words ["as also the Rent that fell due since the Determination of the old Original Lease, according to the Rent of One Hundred and Twenty Pounds Sterling per Annum"], to insert these Words; (videlicet,) ["to be computed and settled by the proper Officer of the said Court of Exchequer, who is to make both Parties all just Allowances"]; and after these Words, (videlicet,) ["provided the said Defendant Walter Bagenall shall live so long"], to insert these Words; (videlicet,) ["which Lease shall be settled by such proper Officer, in case the Parties differ about the same"]. Ordered, That the Cause appointed to be heard on Monday be put off to the Wednesday following; and the other Causes removed in Course. Dominus Cancellarius declaravit præsens Parliamentum continuandum esse usque ad et in diem Lunæ, vicesimum quartum diem instantis Aprilis, hora undecima Auroræ, Dominis sic decernentibus. To return the Bill, intituled, "An Act for vesting the Manor of Goldborn, Part of the settled Estate of William Duke of Devonshire, in the County of Lancaster, in the said Duke and his Heirs; and for settling the Manor of Blackwall, in the County of Derby, in Lieu thereof, to the like Uses;" and to acquaint this House, that they have agreed to the same, without any Amendment. and Sir Brian Broughton's Bill. To return the Bill, intituled, "An Act to enable Sir Brian Broughton Baronet, an Infant, to enter into Marriage Articles, notwithstanding his Infancy;" and to acquaint this House, that they have agreed to the same, without any Amendment. Hodie 3a vice lecta est Billa, intituled, "An Act for granting an Aid to His Majesty, by a Land Tax to be raised in Great Britain, for the Service of the Year One Thousand Seven Hundred and Thirtyeight." Hodie 3a vice lecta est Billa, intituled, "An Act for enclosing and dividing the Common Fields and Common Grounds, in the Manor and Parish of Binbrooke, in the County of Lincoln." Wilson, to be Guardian to the Marq. of Annandale. 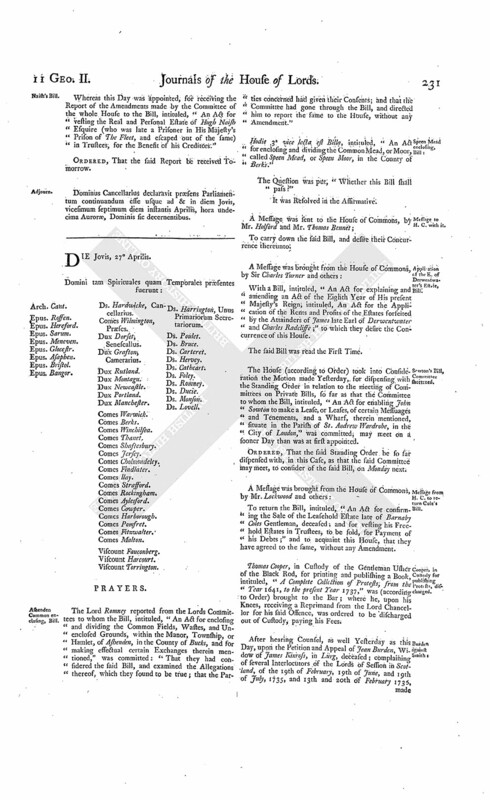 A Petition of George Marquis of Annandale, was presented, and read; praying, "That George Wilson Gentleman may be assigned the Petitioner's Guardian, in order to the putting in an Answer to the Cross Appeal of the Earl and Countess of Hoptoun; and that Leave may be given to amend the Petitioner's Appeal, by inserting the said George Wilson as Guardian and next Friend to the Petitioner." And thereupon the said Wilson was called in, and examined, at the Bar, in relation to this Matter; and acquainted the House, "That the said Marquis was beyond Sea, on his Travels; and that this Application to the House was made by the Advice of his Counsel." The said Wilson was directed to withdraw. Ordered, That the said George Wilson be assigned Guardian to the said Marquis; and that he have Liberty to amend the said Appeal, as desired. Address for Papers about the Spanish Depredation;. Ordered, That an humble Address be presented to His Majesty, "That He will be graciously pleased to give Directions, that there be laid before this House a Copy of the Affidavit of Captain Benjamin Way, relating to the Seizure of his Ship by the Spaniards in America; and also a Copy of the Affidavit made, relating to the Imprisonment of divers English Sailors, lately brought by the Spaniards from America to Cadiz in Spain; and also of the Accounts transmitted by His Majesty's Minister at Madrid and the English Consul at Cadiz, relating to such Imprisonment; and of the Orders sent to them respectively thereupon." Hodie 2a vice lecta est Billa, intituled, "An Act to enable Dorothea Clerk to sell Lands, in the County of Dumfries, for Payment of Debts charged thereupon; and to purchase other Lands, to be settled to the same Uses as the Estate to be sold is settled." Viscount Fauconberg. L. Arch. Cant. L. Bp. St. Asaph. Ld. Clinton. Their Lordships, or any Five of them; to meet at the usual Time and Place, on Tuesday the 9th Day of May; and to adjourn as they please. Frauds by Tenants, to prevent, Bill. The House (according to Order) was adjourned during Pleasure, and put into a Committee again upon the Bill, intituled, "An Act for the more effectual securing the Payment of Rents, and preventing Frauds by Tenants." And the Earl of Warwick reported from the said Committee, "That they had gone through the Bill, and made several Amendments thereunto; which he was directed to report, when the House will please to receive the same." Ordered, That the said Report be received on Thursday next; and the Lords to be summoned. The Earl of Cholmondeley reported from the Lords Committees to whom the Bill, intituled, "An Act for repairing the Roads from the Town of Loughborough, in the County of Leicester, to the Town of Derby, in the County of Derby, and from the said Town of Derby to the Town of Brassington, in the said County of Derby, and from the said Town of Derby, through the Town of Asheborne, in the said County of Derby, to Hurdloe-House, in the Parish of Hartington, in the said County," was committed: "That they had considered the said Bill, and examined the Allegations thereof, which were found to be true; and that the Committee had gone through the Bill, and directed him to report the same to the House, without any Amendment." Hodie 1a vice lecta est Billa, intituled, "An Act for enabling John Sowton to make a Lease, or Leases, of certain Messuages and Tenements, and a Wharf, therein mentioned, situate in the Parish of Saint Andrew Wardrobe, in the City of London." Brabazon's Appeal to be heard peremptorily. Ordered, That the Cause wherein Mr. Brabazon is Appellant, and the Lord Dudley and Ward Respondent, which stands for Monday next, be then peremptorily heard. Dominus Cancellarius declaravit præsens Parliamentum continuandum esse usque ad & in diem Martis, vicesimum quintum diem instantis Aprilis, hora undecima Auroræ, Dominis sic decernentibus. E. of Hoptoun against M. of Annandale. As was likewise the several and separate Answer of Richard Allen, One of the Respondents to the Appeal of Elizabeth Halpenn, commonly called Lady Lawley. The Earl of Warwick reported from the Lords Committees for Privileges, to whom was referred the Matter of the Complaint of a Breach of Privilege, committed by William Allanson Esquire, in causing several Elm Trees to be lopped and cut, on the Waste of the Manor of Isleworth Sion, in the County of Middlesex, in the Month of November last, though he was, by the Duke of Somerset's Bailiff, cautioned and warned not to lop or cut more of the said Trees: "That the Committee had examined several Persons upon Oath, in relation to the Matter of the said Complaint; and had likewise heard the said William Allanson, in his Defence, touching the Matter complained of; and are of Opinion, That the said William Allanson is guilty of a Breach of the Privilege of this House." Allanson attached, for causing Trees at Isleworth Sion to be cut. Ordered, That the Serjeant at Arms attending this House, his Deputy or Deputies, do forthwith attach the Body of the said William Allanson, and keep him in safe Custody until further Order of this House; and this shall be a sufficient Warrant on that Behalf. To Francis Jephson Esquire, Serjeant at Arms attending this House, his Deputy or Deputies, and every of them. Cooper to be brought to the Bar, for printing a Book of Protests. Upon reading the Petition of Thomas Cooper, in Custody of the Gentleman Usher of the Black Rod, for printing and publishing a Book, intituled, "A compleat Collection of Protests, from the Year 1641, to the present Year 1737;" expressing his Sorrow for his said Offence, begging Pardon for the same, and assuring the House, "That he will never offend their Lordships again;" humbly representing, "That his Confinement will be a great Detriment, if not the total Ruin, of the Petitioner, his Wife, and Family;" and praying, "That he may be discharged out of Custody:"
It is Ordered, That the Petitioner be brought to the Bar of this House on Thursday next, in order to his Discharge. The Lord Chamberlain acquainted the House, "That the Lords with White Staves (according to Order) had presented to His Majesty the Address of this House Yesterday, for Copies of Papers relating to the Depredations of the Spaniards; and that His Majesty had been pleased to give Order that the same should be laid before their Lordships." Accordingly the Duke of Newcastle presented to the House, Copies of several Papers, in Pursuance of the said Address; as also of a former Address of the 17th Instant; with Lists thereof. "Copy of a Petition of the Merchants and Planters, in Behalf of themselves and others trading to, or interested in, the British Colonies in America." "Draught of a Memorial to be presented by Mr. Keene to the King of Spain; and Translation." "Copy of a short State of the Capture of the Ship St. James, with the Proofs annexed, taken May 12th, 1737." "Copy of a short State of the Capture of the Ship Prince William, with the Proofs annexed, taken March 24th, 1736/7." "Copy of a short State of the Capture of The George Brigantine, with the Proofs annexed, taken May 21st, 1737." "Copy of a short State of the Capture of Two British Ships, 1st, The Loyal Charles, 2d, The Dispatch, taken in July or August 1737, with the Proofs annexed." "on the 12th July, 1737; with the Proofs annexed." "Copy of a short State of the Attack of the Sloop Cæsar, July 1st, 1737, with the Proof annexed." "Copy of a short State of the boarding and plundering the Ship Sea Horse, William Griffith Master, on the 18th or 19th of August, 1737." "Copy of a short State of the Captures of the Brigantine Two Sisters, Brigantine Hopewell, and Two other Ships, Part of the Salt Fleet, taken the 14th March, 1732/3; with the Proofs annexed." "Copy of a short State of the Captures of the Six following Ships; the Sloop Endeavour, a Bermuda Sloop, a Sloop of Anguilla, a Sloop of Antigua, a Sloop of St. Christophers, The Friends Adventure; all taken in February 1734/5; and of Three more Ships, which were attacked at the same Time, but escaped; with the Proofs annexed." "Copy of a short State of the Captures of the Sloop Thomas and Prince William; the 1st taken the 28th March 1734, and the 2d the 9th September 1731; with the Proofs annexed." "Copy of a short State of the Capture of the Ship Richmond, taken April 14th, 1730; with the Proofs annexed." "Copy of a short State of the Capture of the Ship Pheasant, taken January 13th, 1728/9; with the Proofs annexed." "Copy of the Petition of Edmund Sanders, Henry Tongue, and Richard Farr, of Bristol, Merchants, in Behalf of themselves, Henry Lloyd deceased, the Insurers, Master, and Mariners, of the Ship Robert Galley, taken May 12th, 1729." "Copy of the Affidavit of James Wimble, concerning his Losses by the Spaniards, in the Years 1719, 1720, 1727, and 1728." "Copy of the Affidavit of Murray Crymble, Oct'r 31st, 1737." "Translation of a Letter from the Governor of Porto Rico, to Mr. Mathew, Governor of The Leeward Islands, Sept'r 4/15th, 1734." "Copy of a Memorial, accompanying the Proofs and Documents presented to Mons. de la Quadra, relating to the Depredations in America, Nov. 29th,/Dec. 10, 1737; and Translation." "Copy of a Letter from Mons. de la Quadra, to Mr. Keene, February 10th/21, 1737/8; and Translation." "Copy of a Letter from Mr. Keene, to Mons. de la Quadra, February 17th/28, 1737/8; and Translation." "Draught of a Letter to be wrote by Mr. Keene to Mons. de la Quadra; and Translation." "Extract of a Letter from Consul Cayley, to the Duke of Newcastle, Cadiz, January 17th/28, 1737/8." "Copy of a Letter from Mr. Keene to Mons. de la Quadra, February 18th/March 1, 1737/8; and Translation." "Copy of a Memorial relating to several Ships taken in America, accompanied with Proofs and Documents; and Translation." "Extract of a Letter from Consul Cayley, to the Duke of Newcastle, January 17th/28, 1737/8." "Copy of a Letter from Luke Jefferson, Cadiz, February 6th, 1737/8." "Copy of a Letter from Francis Musgrove, January 22d, 1737/8." "Copy of a Letter from James Peutron, February 1st, 1737/8." "Extract of a Letter from the Duke of Newcastle, to Mr. Keene, March 17th, 1737/8." "Copy of a Letter from the Duke of Newcastle, to Consul Cayley, March 17th, 1737/8." "Extract of a Letter from Mr. Keene, to the Duke of Newcastle, March 6/17th, 1737/8." "Extract of a Letter from Consul Cayley, to the Duke of Newcastle, Feb 28/March 11th, 1737/8." "Extract of a Letter from Mr. Keene, to the Duke of Newcastle, March 20th/31, 1737/8." "Extract of a Letter from Consul Cayley, to the Duke of Newcastle, March 7/18th, 1737/8." "Copy of the Deposition of William Haines and others. "Copy of the Deposition of Luke Jefferson and others." "Copy of the Deposition of Captain Benjamin Way." "Extract of a Letter from the Duke of Newcastle, to Consul Cayley, April 12th, 1738." Ordered, That the said Papers be taken into Consideration on this Day Sevennight; and the Lords to be summoned. Order for them to be considered. Ordered, That Captain Benjamin Way and Captain Philip Delamotte, bound from Jamaica to London, and Captain Kinslaugh, bound from St. Christophers to London, taken by the Spaniards and carried to The Havannah, do attend this House on that Day. Prince to be brought to the Bar. It is Ordered, That the Petitioner be brought to the Bar To-morrow, in order to his Discharge. Enlarging the Time for taking the Oaths, Bill. 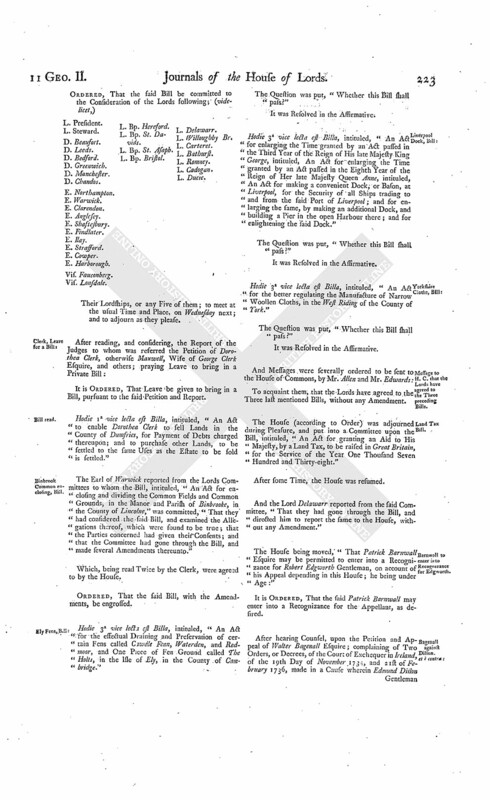 The House (according to Order) was adjourned during Pleasure, and put into a Committee upon the Bill, intituled, "An Act to indemnify Persons who have omitted to qualify themselves for Offices, or to read the Prayers, and make the Declarations and Subscriptions required, within the respective Times limited by Law; and for allowing further Time for those Purposes." 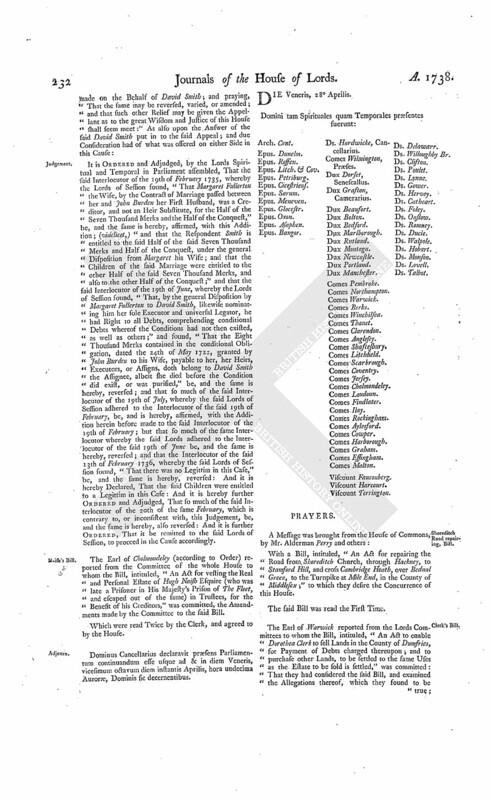 The House (according to Order) was adjourned during Pleasure, and put into a Committee upon the Bill, intituled, "An Act for building a Bridge cross the River Thames, from The Wool-staple, or thereabouts, in the Parish of St. Margaret, in the City of Westminister, to the opposite Shore, in the County of Surrey." Frauds by Tenants, to prevent, Bill: Judges to attend at the Report. Ordered, That the Judges do attend this House upon Thursday next, when the Report of the Amendments made by the Committee of the whole House to the Bill relating to Tenants is ordered to be received. 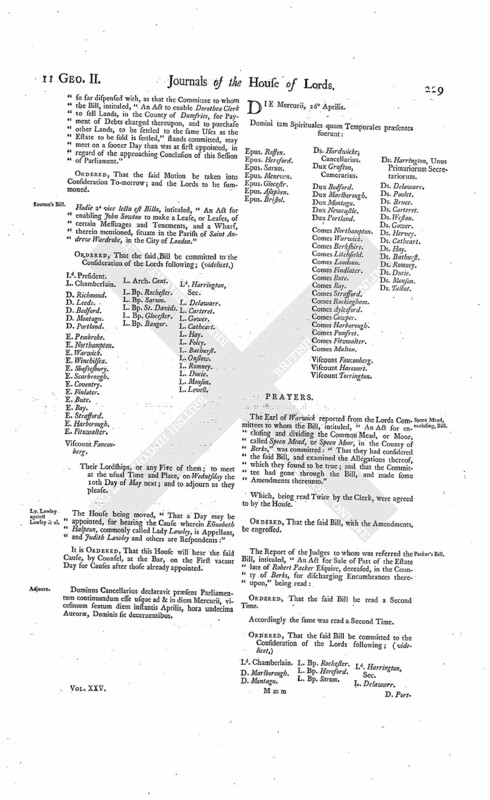 The Order of the Day being read, for the House to be put into a Committee upon the Re-commitment of the Bill, intituled, "An Act for vesting the Real and Personal Estate of Hugh Naish Esquire (who was late a Prisoner in His Majesty's Prison of The Fleet, and escaped out of the same) in Trustees, for the Benefit of his Creditors." Thomas Bulner, John Cotton, Daniel Hopkins, William Goldesborough, Simon Stanton, Hugh Kelly, Francis Edwards, and Henry Wood, were called in, and sworn, in order to be examined before the said Committee, to make Proof of the Allegations of the said Bill. And the House was adjourned during Pleasure, and put into a Committee upon the said Bill. And the Earl of Cholmondeley reported from the said Committee, "That they had examined several Witnesses upon Oath, to prove the Allegations of the Bill; and had gone through the same, and made some Amendments thereunto, which they had directed him to report, when the House will please to receive the same." Hodie 3a vice lecta est Billa, intituled, "An Act for repairing the Roads from the Town of Loughborough, in the County of Leicester, to the Town of Derby, in the County of Derby, and from the said Town of Derby to the Town of Brassington, in the said County of Derby, and from the said Town of Derby through the Town of Asheborne, in the said County of Derby, to Hurdloe House, in the Parish of Hartingdon, in the said County." Clerk's Bill: Motion to shorten Committee. The House being moved, "That the Standing Order, requiring Fourteen Days Notice to be given of the Meeting of Committees on Private Bills, may be so far dispensed with, as that the Committee to whom the Bill, intituled, "An Act to enable Dorothea Clerk to sell Lands, in the County of Dumfries, for Payment of Debts charged thereupon, and to purchase other Lands, to be settled to the same Uses as the Estate to be sold is settled," stands committed, may meet on a sooner Day than was at first appointed, in regard of the approaching Conclusion of this Session of Parliament." Hodie 2a vice lecta est Billa, intituled, "An Act for enabling John Sowton to make a Lease, or Leases, of certain Messuages and Tenements, and a Wharf, therein mentioned, situate in the Parish of Saint Andrew Wardrobe, in the City of London." L. Bp. Bangor. Ld. Harrington, Sec. Their Lordships, or any Five of them; to meet at the usual Time and Place, on Wednesday the 10th Day of May next; and to adjourn as they please. Ly. Lawley against Lawley & al. The House being moved, "That a Day may be appointed, for hearing the Cause wherein Elizabeth Halpenn, commonly called Lady Lawley, is Appellant, and Judith Lawley and others are Respondents:"
Dominus Cancellarius declaravit præsens Parliamentum continuandum esse usque ad & in diem Mercurii, vicesimum sextum diem instantis Aprilis, hora undecima Auroræ, Dominis sic decernentibus. The Earl of Warwick reported from the Lords Committees to whom the Bill, intituled, "An Act for enclosing and dividing the Common Mead, or Moor, called Speen Mead, or Speen Moor, in the County of Berks," was committed: "That they had considered the said Bill, and examined the Allegations thereof, which they found to be true; and that the Committee had gone through the Bill, and made some Amendments thereunto." Ordered, That the said Bill be read a Second Time. Accordingly the same was read a Second Time. Viscount Torrington. L. Bp. Rochester. L. Bp. Bristol. Ld. Harrington, Sec. Their Lordships, or any Five of them; to meet on Thursday the 11th Day of May next, at the usual Time and Place; and to adjourn as they please. Hodie 3a vice lecta est Billa, intituled, "An Act for building a Bridge cross the River Thames, from The Wool-staple, or thereabouts, in the Parish of Saint Margaret, in the City of Westminster, to the opposite Shore in the County of Surrey." Hodie 3a vice lecta est Billa, intituled, "An Act to indemnify Persons who have omitted to qualify themselves for Offices, or to read the Prayers, and make the Declarations and Subscriptions required, within the respective Times limited by Law; and for allowing further Time for those Purposes." Message to H. C. that the Lords have agreed to the Two preceding Bills. M. Annandale against E. Hoptoun; & è contra. Sowton's Bill: Motion to shorten Committee. The House being moved, "That the Standing Order, requiring Fourteen Days Notice to be given of the meeting of Committees on Private Bills, may be so far dispensed with, as that the Committee to whom the Bill, intituled, "An Act for enabling John Sowton to make a Lease, or Leases, of certain Messuages and Tenements, and a Wharf, therein mentioned, situate in the Parish of Saint Andrew Wardrobe, in the City of London," stands committed, may meet on a sooner Day than was at first appointed, in regard of the approaching Conclusion of this Session of Parliament:"
D. of Greenwich's Privilege: Prince discharged. Jasper Prince, of Chipping Norton, in the County of Oxford, Gentleman, in Custody of the Serjeant at Arms attending this House, for serving an Ejectment on a Tenant of the Duke of Argyle and Greenwich, was (according to Order) brought to the Bar; where he, on his Knees, receiving a Reprimand from the Lord Chancellor for his said Offence, was ordered to be discharged out of Custody, paying his Fees. The House (according to Order) took into Consideration the Motion made Yesterday, for dispensing with the Standing Order, in relation to the meeting of Committees on Private Bills, so far as that the Committee to whom the Bill, intituled, "An Act to enable Dorothea Clerk to sell Lands, in the County of Dumfries, for Payment of Debts charged thereupon; and to purchase other Lands, to be settled to the same Uses as the Estate to be sold is settled," stands committed, may meet on a sooner Day than was at first appointed. Ordered, That the said Standing Order be so far dispensed with, in this Case, as that the said Committee may meet, to consider of the said Bill, on Friday next. Hodie 3a vice lecta est Billa, intituled, "An Act for confirming and establishing an Agreement between William Studholm Gentleman and Cuthbert Hodgson Gentleman, in relation to the Will and Estate of Michael Studholm Esquire, deceased." Then some Amendments were proposed to be made to the Bill; and the same were agreed to. And the Question being put, "Whether this Bill, with the Amendments, shall pass?" It is Ordered, That the further Hearing of the said Cause be adjourned till To-morrow; and the Cause appointed for that Day be put off to this Day Sevennight, and the other Causes removed in Course. 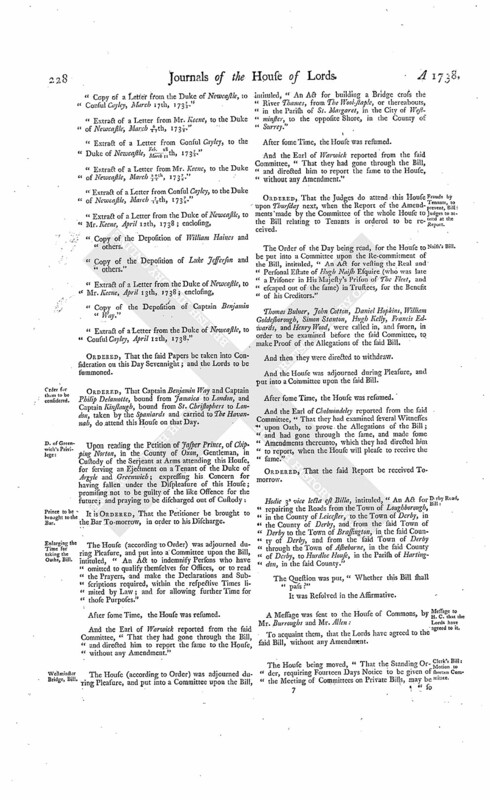 Ordered, That the Report of the Amendments made by the Committee of the whole House to the Bill, intituled, "An Act for more effectual securing the Payment of Rents, and preventing Frauds by Tenants," which was ordered to be received Tomorrow, be received on Friday next; and the Judges then to attend; and the Lords to be summoned. 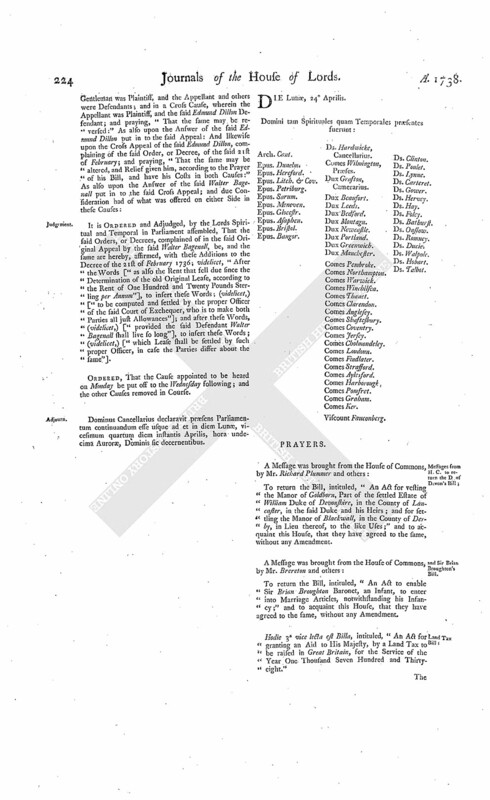 Whereas this Day was appointed, for receiving the Report of the Amendments made by the Committee of the whole House to the Bill, intituled, "An Act for vesting the Real and Personal Estate of Hugh Naish Esquire (who was late a Prisoner in His Majesty's Prison of The Fleet, and escaped out of the same) in Trustees, for the Benefit of his Creditors." Dominus Cancellarius declaravit præsens Parliamentum continuandum esse usque ad & in diem Jovis, vicesimum septimum diem instantis Aprilis, hora undecima Auroræ, Dominis sic decernentibus. The Lord Romney reported from the Lords Committees to whom the Bill, intituled, "An Act for enclosing and dividing the Common Fields, Wastes, and Unenclosed Grounds, within the Manor, Township, or Hamlet, of Ashenden, in the County of Bucks, and for making effectual certain Exchanges therein mentioned," was committed: "That they had considered the said Bill, and examined the Allegations thereof, which they found to be true; that the Parties concerned had given their Consents; and that the Committee had gone through the Bill, and directed him to report the same to the House, without any Amendment." Hodie 3a vice lecta est Billa, intituled, "An Act for enclosing and dividing the Common Mead, or Moor, called Speen Mead, or Speen Moor, in the County of Berks." Application of the E. of Derwentwater's Estate, Bill. 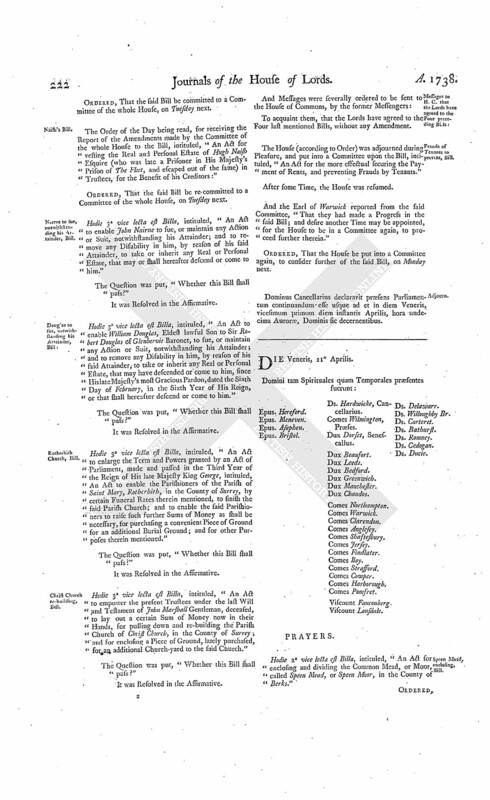 With a Bill, intituled, "An Act for explaining and amending an Act of the Eighth Year of His present Majesty's Reign, intituled, An Act for the Application of the Rents and Profits of the Estates forfeited by the Attainders of James late Earl of Derwentwater and Charles Radcliffe;" to which they desire the Concurrence of this House. 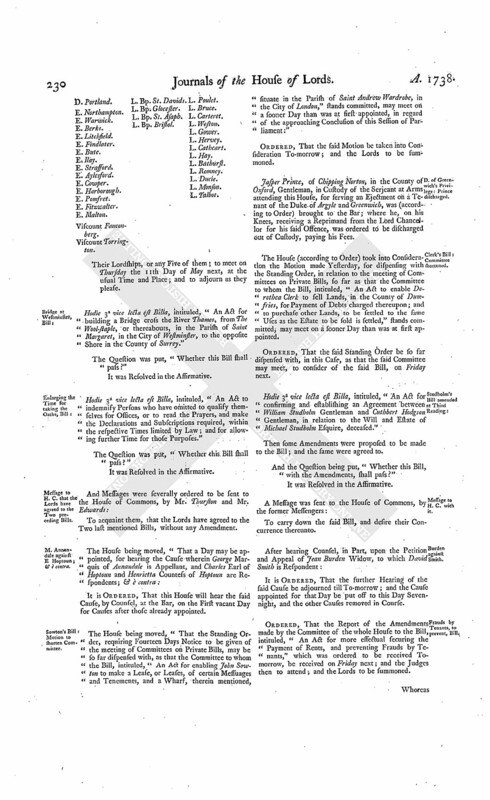 The House (according to Order) took into Consideration the Motion made Yesterday, for dispensing with the Standing Order in relation to the meeting of Committees on Private Bills, so far as that the Committee to whom the Bill, intituled, "An Act for enabling John Sowton to make a Lease, or Leases, of certain Messuages and Tenements, and a Wharf, therein mentioned, situate in the Parish of St. Andrew Wardrobe, in the City of London," was committed, may meet on a sooner Day than was at first appointed. Ordered, That the said Standing Order be so far dispensed with, in this Case, as that the said Committee may meet, to consider of the said Bill, on Monday next. Message from H. C. to return Cole's Bill. To return the Bill, intituled, "An Act for confirming the Sale of the Leasehold Estate late of Barnaby Coles Gentleman, deceased; and for vesting his Freehold Estates in Trustees, to be sold, for Payment of his Debts;" and to acquaint this House, that they have agreed to the same, without any Amendment. Cooper, in Custody for publishing Protests, discharged. Thomas Cooper, in Custody of the Gentleman Usher of the Black Rod, for printing and publishing a Book, intituled, "A Complete Collection of Protests, from the Year 1641, to the present Year 1737," was (according to Order) brought to the Bar; where he, upon his Knees, receiving a Reprimand from the Lord Chancellor for his said Offence, was ordered to be discharged out of Custody, paying his Fees. 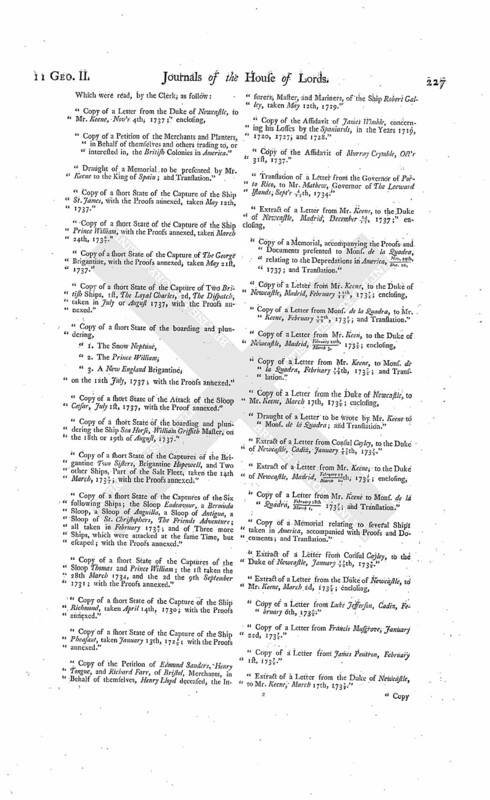 It is Ordered and Adjudged, by the Lords Spiritual and Temporal in Parliament assembled, That the said Interlocutor of the 19th of February 1735, whereby the Lords of Session found, "That Margaret Fullerton the Wife, by the Contract of Marriage passed between her and John Burden her First Husband, was a Creditor, and not an Heir Substitute, for the Half of the Seven Thousand Merks and the Half of the Conquest," be, and the same is hereby, affirmed, with this Addition; (videlicet,) "and that the Respondent Smith is entitled to the said Half of the said Seven Thousand Merks and Half of the Conquest, under the general Disposition from Margaret his Wife; and that the Children of the said Marriage were entitled to the other Half of the said Seven Thousand Merks, and also to the other Half of the Conquest;" and that the said Interlocutor of the 19th of June, whereby the Lords of Session found, "That, by the general Disposition by Margaret Fullerton to David Smith, likewise nominating him her sole Executor and universal Legator, he had Right to all Debts, comprehending conditional Debts whereof the Conditions had not then existed, as well as others;" and found, "That the Eight Thousand Merks contained in the conditional Obligation, dated the 24th of May 1722, granted by John Burden to his Wife, payable to her, her Heirs, Executors, or Assigns, doth belong to David Smith the Assignec, albeit she died before the Condition did exist, or was purified," be, and the same is hereby, reversed; and that so much of the said Interlocutor of the 19th of July, whereby the said Lords of Session adhered to the Interlocutor of the said 19th of February, be, and is hereby, affirmed, with the Addition herein before made to the said Interlocutor of the 19th of February; but that so much of the same Interlocutor whereby the said Lords adhered to the Interlocutor of the said 19th of June be, and the same is hereby, reversed; and that the Interlocutor of the said 13th of February 1736, whereby the said Lords of Session found, "That there was no Legittim in this Case," be, and the same is hereby, reversed: And it is hereby Declared, That the said Children were entitled to a Legittim in this Case: And it is hereby further Ordered and Adjudged, That so much of the said Interlocutor of the 20th of the same February, which is contrary to, or inconsistent with, this Judgement, be, and the same is hereby, also reversed: And it is further Ordered, That it be remitted to the said Lords of Session, to proceed in the Cause accordingly. The Earl of Cholmondeley (according to Order) reported from the Committee of the whole House to whom the Bill, intituled, "An Act for vesting the Real and Personal Estate of Hugh Naish Esquire (who was late a Prisoner in His Majesty's Prison of The Fleet, and escaped out of the same) in Trustees, for the Benefit of his Creditors," was committed, the Amendments made by the Committee to the said Bill. Which were read Twice by the Clerk, and agreed to by the House. Dominus Cancellarius declaravit præsens Parliamentum continuandum esse usque ad & in diem Veneris, vicesimum octavum diem instantis Aprilis, hora undecima Auroræ, Dominis sic decernentibus. With a Bill, intituled, "An Act for repairing the Road from Shoreditch Church, through Hackney, to Stamford Hill, and cross Cambridge Heath, over Bednal Green, to the Turnpike at Mile End, in the County of Middlesex;" to which they desire the Concurrence of this House. The Earl of Warwick reported from the Lords Committees to whom the Bill, intituled, "An Act to enable Dorothea Clerk to sell Lands in the County of Dumfries, for Payment of Debts charged thereupon; and to purchase other Lands, to be settled to the same Uses as the Estate to be sold is settled," was committed: That they had considered the said Bill, and examined the Allegations thereof, which they found to be true; that the Parties concerned had given their Consents; and that the Committee had gone through the Bill, and made some Amendments thereunto." Hodie 3a vice lecta est Billa, intituled, "An Act for vesting the Real and Personal Estate of Hugh Naish Esquire (who was late a Prisoner in His Majesty's Prison of The Fleet, and escaped out of the same) in Trustees, for the Benefit of his Creditors." To carry down the said Bill; and acquaint them, that the Lords have agreed to the said Bill, with some Amendments, whereunto their Lordships desire their Concurrence. Hodie 3a vice lecta est Billa, intituled, "An Act for enclosing and dividing the Common Fields, Wastes, and Unenclosed Grounds, within the Manor, Township, or Hamlet, of Ashenden, in the County of Bucks; and for the making effectual certain Exchanges therein mentioned." Frauds by Tenants to prevent, Bill. The Earl of Warwick (according to Order) reported from the Committee of the whole House to whom the Bill, intituled, "An Act for the more effectual securing the Payment of Rents, and preventing Frauds by Tenants," was committed: "That they had considered the said Bill, and heard the Judges thereupon; and had gone through the Bill, and made several Amendments thereunto." 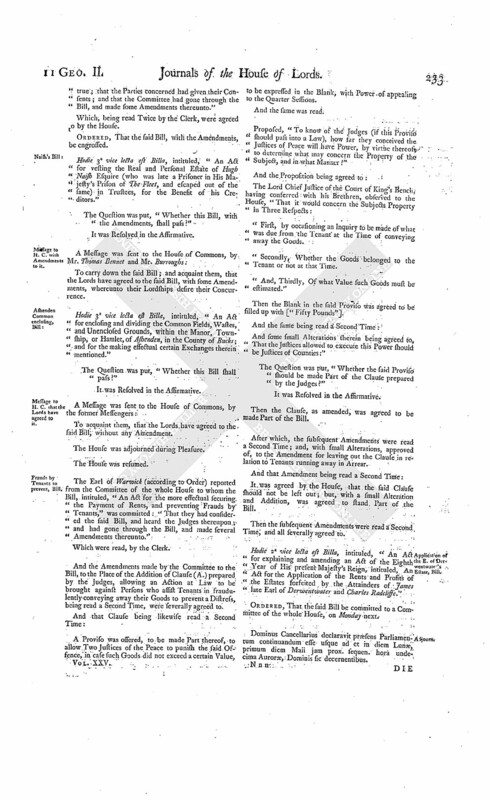 And the Amendments made by the Committee to the Bill, to the Place of the Addition of Clause (A.) prepared by the Judges, allowing an Action at Law to be brought against Persons who assist Tenants in fraudulently conveying away their Goods to prevent a Distress, being read a Second Time, were severally agreed to. A Proviso was offered, to be made Part thereof, to allow Two Justices of the Peace to punish the said Offence, in case such Goods did not exceed a certain Value, to be expressed in the Blank, with Power of appealing to the Quarter Sessions. And the same was read. Proposed, "To know of the Judges (if this Proviso should pass into a Law), how far they conceived the Justices of Peace will have Power, by virtue thereof to determine what may concern the Property of the Subject, and in what Manner?" "First, by occasioning an Inquiry to be made of what was due from the Tenant at the Time of conveying away the Goods. "Secondly, Whether the Goods belonged to the Tenant or not at that Time. "And, Thirdly, Of what Value such Goods must be estimated." Then the Blank in the said Proviso was agreed to be filled up with ["Fifty Pounds"]. And some small Alterations therein being agreed to, That the Justices allowed to execute this Power should be Justices of Counties:"
The Question was put, "Whether the said Proviso should be made Part of the Clause prepared by the Judges?" 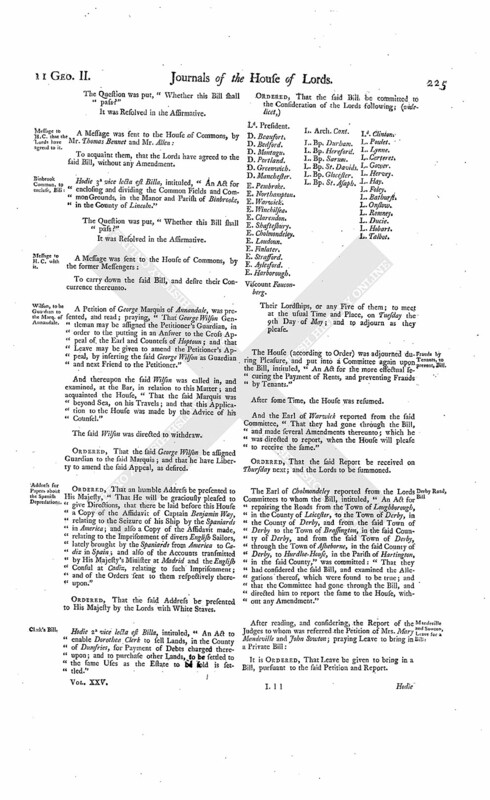 Then the Clause, as amended, was agreed to be made Part of the Bill. After which, the subsequent Amendments were read a Second Time; and, with small Alterations, approved of, to the Amendment for leaving out the Clause in relation to Tenants running away in Arrear. It was agreed by the House, that the said Clause should not be left out; but, with a small Alteration and Addition, was agreed to stand Part of the Bill. Then the subsequent Amendments were read a Second Time, and all severally agreed to. Hodie 2a vice lecta est Billa, intituled, "An Act for explaining and amending an Act of the Eighth Year of His present Majesty's Reign, intituled, An Act for the Application of the Rents and Profits of the Estates forfeited by the Attainders of James late Earl of Derwentwater and Charles Radcliffe." Dominus Cancellarius declaravit præsens Parliamentum continuandum esse usque ad et in diem Lunæ, primum diem Maii jam prox. sequen. hora undecima Auroræ, Dominis sic decernentibus.